LAHORE: (Sunday, December 2, 2018): Punjab University Institute of Applied Psychology (IAP) will organize an international conference of ‘Applied Psychology; Practices and Interventions (ICAP-2019)’ on February, 2019. In this regard, a workshop was held on ‘Quantitative Data Analysis using SPSS’. Mr. Muhammad Faran, Lecturer at the Department of Psychology, University of Management and Technology, Lahore was the resource person while IAP Director & Chief organizer Prof Dr Farah Malik, organizing Secretary Dr Mujeeba Ashraf, faculty members and students of other universities were present on the occasion. 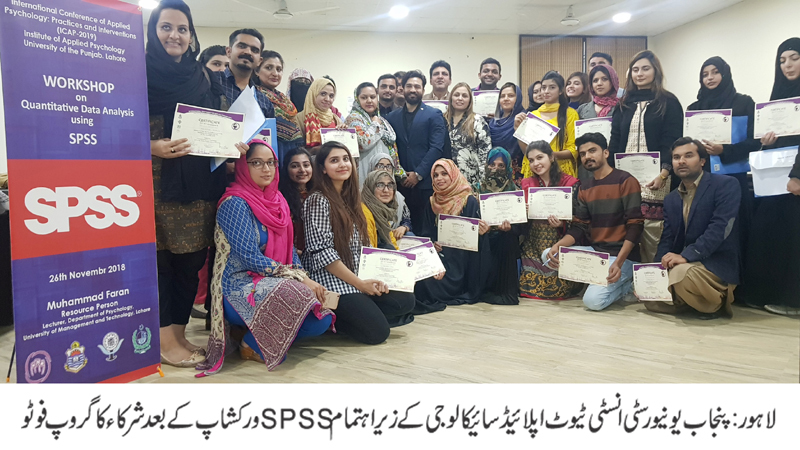 The workshop provided a promising opportunity for the attendees to enhance their understanding of interpreting statistical data and effectively dealing with research work in their respective areas using SPSS. Later, certificates were distributed among the participants.